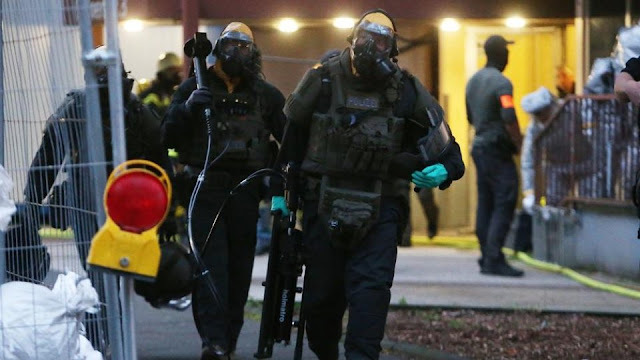 The Federal Court Of Justice has just (22:20h CET) confirmed that the material found is to be classed as “biological warfare”, and turned the preliminary custody into proper arrest. Cologne: Tunisian Arrested On Suspicion Of Preparing Toxic Attack An original translation from Kölner Express: Terror Suspicion in Cologne: Poison Lethal In Smallest Doses. What did the Tunisian plan? What was he planning, the 29-year-old Tunisian who was arrested Tuesday night in his apartment in Chorweiler? Kölner Express and Kölner Stadt-Anzeiger learned from investigative circles that the substance discovered during the special forces operation on Tuesday night in the apartment of the suspect: Ricin is the third most poisonous substance in the world – 25,000 times more poisonous than Strychnine. The investigators acted at 8PM. The Office For The Protection Of The State had received clues that the suspect was handling highly toxic substances in his apartment. The Poison Ricin Most people aren’t aware that one of the deadliest poisons in the world can be processed from the same plant used to make the harmless castor oil. If, when pressing the oil, the toxic components of the seeds completely remain in the residue and not in the oil, the smallest quantities of ricin can kill a person. No Antidote For children, five, and for adults, between ten and twenty seeds, or one milligram of the poison are enough. The substance ricin damages the digestive tract – colon, kidneys and liver. The mucosal membranes of the stomach and of the colon die and internal bleeding occurs. So far there is no antidote or vaccine. Investigations are continuing It has not yet been announced how much of this substance was discovered in the apartment. The specialists were still on site Wednesday morning to carry out further examinations. The main suspect is still in police custody. He is currently being interrogated. His wife, allegedly a German who converted to Islam, has been released in the meantime. Terror Suspicion The Federal Prosecutor’s Office has taken over investigations, as a terrorist background cannot be ruled out. Current investigations are for the suspicion of a “grave subversive act of violence”, but it has yet to be verified whether the composition and amount of the substances discovered might have negative consequences. Contrary to the initial police statement reported earlier, the four underage children, one of them a baby, were not taken into custody by the city of Cologne. As the Federal Attorney is not investigating the Tunisian’s wife, but only the husband himself, the wife and her children were released later that same night. As Kölner Express and Kölner Stadt-Anzeiger also learned, the suspect only came to Germany in November 2016. He was deemed unremarkable and hadn’t drawn police attention upon himself previously. He only came onto the radar of State Protection and investigative authorities after they were tipped off. From then on he was surveilled, and now has been arrested by special forces officers (SEK) to avert risk.